We at Jump Around Party Rentals have the best selection of giant backyard party games! Our Giant Connect 4 rental is a popular party activity that keeps guests entertained for hours! 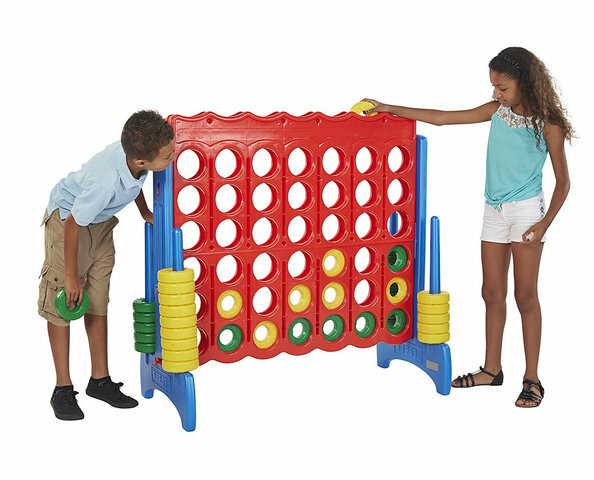 Equipped with multiple ways to play, the Giant Connect 4 comes with a play board that stands 3 feet tall, large plastic play coins that come in blue and red, instructions, and a carrying case for easy travel or storage! Book the GIant Connect 4 today with our online booking system! Add any delivery notes in the order form, and for weekend parties, let us know if earlier delivery works as well! When available, we can deliver a day early at no extra cost to you!